The newest version of the world's leader pool game released. Now you can play with PC and listen to his uncommon and extraordinary comments as you play. Tuned ball physics, new Ivory ball set and 5 extra cues bring even more attraction to the gameplay. Precise cue shots, realistic ball physics, lights playing on ivory and bronze, environmental effects, and a built-in chat. 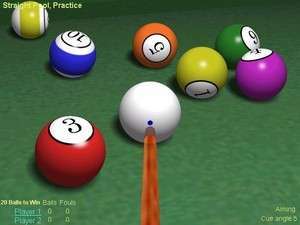 Live Billiards 2.9 is a shareware program and can be used as a demo to try the software until the free trial period has ended. A full version of the program is available after the trial period ends. For security reasons, you should also check out the Live Billiards download at LO4D.com which includes virus and malware tests. Additional screenshots of this application download may be available, too. Provides reviews, screenshots, videos and download links to the highest-rated PC sports games. Reviews are occasionally posted by the editing staff. Check out some of the freeware downloads available in the sports game category. They contain no strings and are available at zero cost. 5 out of 5 based on 2 ratings. Live Billiards has a presence on social networks.